Billed as “the nation’s premier civil rights/human relations agency,” the Anti-Defamation League fights anti-Semitism and all forms of bigotry, defends democratic ideals, and protects civil rights for all. 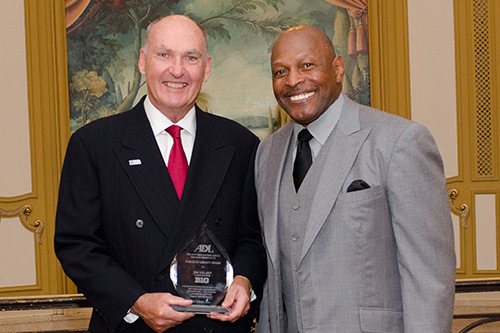 The Chicago chapter of the ADL identified Big Ten Commissioner Jim Delany as their 2014 person of influence, but didn’t have a clear direction for how to communicate his accomplishments in a meaningful and memorable way. TeamWorks worked with the ADL to develop an approach that not only honored Delany, but also reinforced the stated values of the organization to thousands of key supporters. TeamWorks conceived, developed, and executed a multi-media approach to showcase how honoree Delany lived up to the ideals of the ADL. The evening raised over $550,000 to help the ADL continue its vital work in combating hate and bigotry through education programs, law enforcement trainings, and legislative outreach while strengthening the relationships between Delany, the Big Ten Conference, and this immensely important organization.